The church was surrounded by a small area of land on all sides, but there are no records of burials. Likewise no interments within the church were recorded. In 1901 an area of land on the north side of the church was exchanged with the adjacent Nottingham General Hospital, this allowed improved access to the church. Sir Charles Seely Bart. paid for the work to be done and the laying out of the church gardens. A low wall topped by wrought iron railings ran along the east boundary of the site separating it from Standard Hill. Pedestrian gates set between pillars gave access to the entrance in the north-east corner and a pair of wide gates allowed carriages or motor vehicles to enter the site. 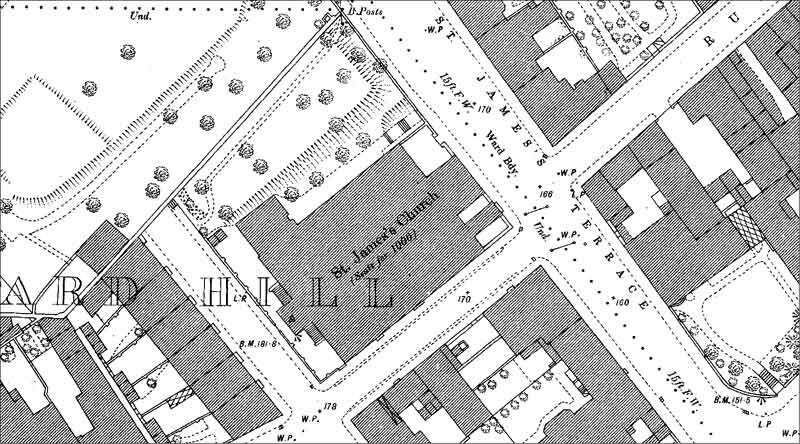 In 1882 the Ordnance Survey 1:500 map shows trees and some landscaping, with paths and steps, on the north side of the church.